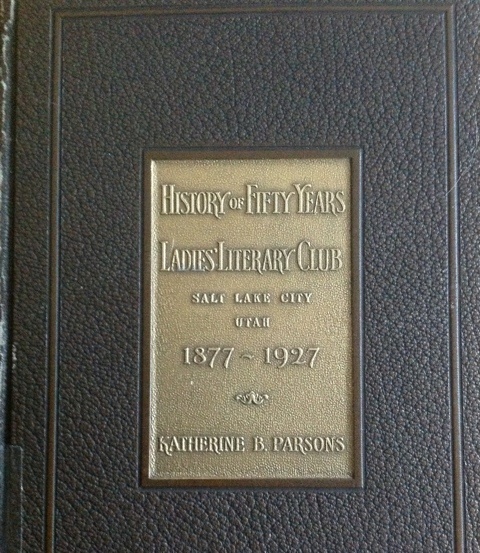 The Ladies Literary Club recently donated their 100-year-old building at 850 E. South Temple to the Utah Heritage Foundation. UHF is refurbishing and will open for public events in 2014. It was absolutely wonderful hearing the news that the Ladies’ Literary Club gifted their South Temple building to the Utah Heritage Foundation. How fortunate for South Temple. And for ALL of us. Some cool old architecture and a piece of our history… SAVED from a potential wrecking ball. Sweet. The news got me curious though. I figured a building like that had to have some good stories and people around it. Who were these ladies anyway? What were their meetings like? How could they afford such a building… and so long ago? The group’s leaders had to be strong, powerful, intelligent women. I surfed over to the City Library and noticed they had what looked like an interesting little book on the LLC, written in 1927. I had to go check this book out. I glanced through the Table of Contents. Skimmed through some funny little passages. Looked at the old pictures of their Club Presidents and then noticed at the back of the book that it listed its members– with their addresses! And I thought, “Anything happening in SLC’s history is bound to include people from YALECREST!” It always has in the past. And continues to this day. So I took a closer look to see if I was right. Not all of Yalecrest was built by 1927. Yet I counted 21 women from Yalecrest. Most of them living on Yale Avenue. I wonder how the following two were related? Sister-in-laws? Mother and daughter-in-law? Other? Mrs. E.M. Bagley, 1411 Yale, was a lifetime member (1914). I see, she was also voted President. Other members are found on: Gilmer, 13th East, 9th South, Harvard, Michigan, and Sunnyside. I KNEW Yalecrest would be represented and involved! Oops. Mrs. W. W. Ray’s name was NOT Leah. It was Leda. Leda Rawlins Ray. My bad.